Everything the Lake Oswego football team has worked for is right there within the Lakers' grasp. There's only one problem, and it's a big one named Sheldon. The Lakers and Irish meet in the Class 6A state football championship at 12:30 p.m. Saturday at Hillsboro Stadium and it promises to be an epic battle. "Sheldon is a good team. I know they've got Michael Johnson, Patrick Herbert, those kids … so we'll see," said Lake Oswego senior lineman Mike Mercep. "It just comes down to game-planning. We'll be ready." "That was never the main goal, just to win the semifinal — we want to get the championship," said Laker junior running back Casey Filkins. "We want to hoist the trophy when the final 48 minutes are up." "We respect them a lot. It's going to be a good game," added LO senior linebacker Gabe DeVille. "We're going to do all the little things right and just play hard." The top-ranked Three Rivers League-champion Lakers enter the game carrying a 12-1 overall record as well as a nine-game winning streak. The Lakers' lone loss this year came to second-ranked Clackamas — a team Sheldon beat 35-14 in its Friday semifinal. Lake Oswego is appearing in its first state championship game since 2012 and aiming to win for the first time since 2011. Both those most recent appearances featured match-ups against Sheldon, a 47-14 Laker win in 2011 and a 13-6 Irish victory in 2012. Thus far in the playoffs, Lake Oswego has already beaten 32nd-ranked North Medford 42-6, No. 16 Oregon City 49-14, No. 8 Central Catholic 35-24 and No. 4 Jesuit 24-14. The third-ranked Southwest Conference-champion Irish enter the game carrying a 10-2 overall record as well as a seven-game winning streak. Sheldon's two losses this year came to Washington's Graham Kapowsin (a 51-50 defeat on Aug. 31) and Jesuit (a 36-32 decision on Oct. 5). 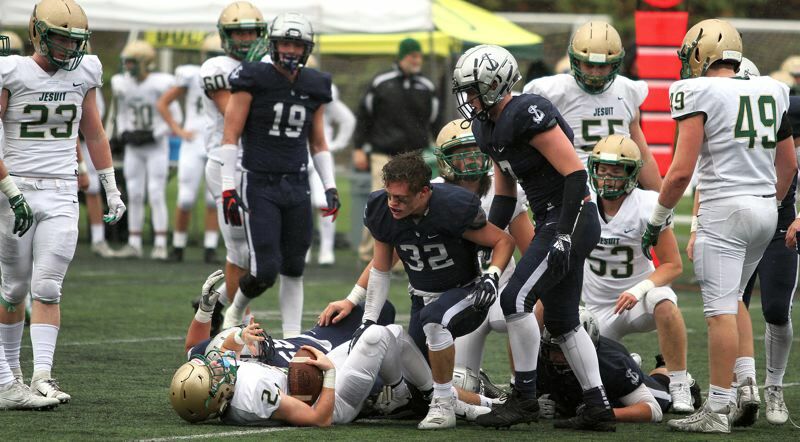 The Irish, like Lake Oswego, are appearing in their first state championship game since 2012. Thus far in the playoffs, Sheldon has already beaten 30th-ranked Centennial 42-6, No. 14 Sherwood 44-28, No. 6 West Linn 38-26 and No. 2 Clackamas 35-14. On offense, the Lakers have a balanced, effective attack led by the following all-Three Rivers League first teamers: senior quarterback Jackson Laurent (6-1, 200), Filkins (5-11, 185) — the TRL Offensive Player of the Year — junior wide receiver Thomas Dukart (6-1, 175), senior tackle Tanner Hall (6-1, 225) and senior guard Ryan Bertelsen (6-3, 285). Laurent has thrown for 2,949 yards and 31 touchdowns with just two interceptions while completing 66 percent of his throws. Filkins has rushed for 1,070 yards and 24 TDs on 155 carries, along with 42 catches for 789 yards and another eight TDs, while Dukart has made 45 catches for 832 yards and 11 scores. "We've just got to stick with the game plan that our coaches give us," said senior running back Keenan DeRaeve (5-10, 180). "We've been trusting them all year long." "It will just take a good week of practice, a good game plan and we'll watch a lot of film — that's it," explained Laurent. Johnson has thrown for 1,707 yards and 19 touchdowns with just three interceptions while completing 58 percent of his passes. He's also run for 1,177 yards and 16 TDs on 143 carries. 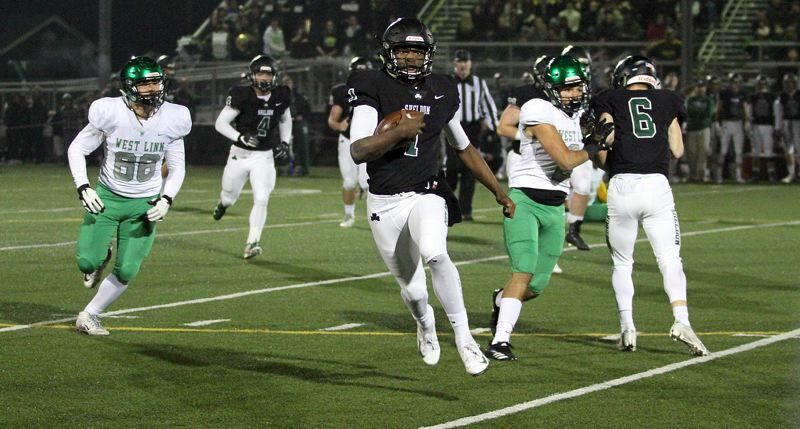 Burgess leads Sheldon rushers with 1,508 yards and 24 touchdowns on 185 carries. Herbert is the team's top receiver with 37 catches for 688 yards and 11 TDs. On defense, Lake Oswego looks to its seven first-team all-TRL picks, led by Mercep (6-2, 220) — the TRL co-Defensive Lineman of the Year — and McGuire, senior linebackers DeVille (5-11, 195) and DeRaeve, junior defensive back Joe Hutson (6-1, 160 and the team leader in interceptions with five), senior defensive back Matt Sebolsky (5-10, 165) and Dukart at safety, and second-team selection Bryson Breeze (a 5-11, 190 senior linebacker). Sheldon is stacked defensively, too, with the Irish led by first-team all-SWC picks Austin Lasby (a 6-2, 330 senior lineman), Parker Wiles (a 6-0, 220 senior linebacker), Jack Folsom (a 5-11, 175 senior defensive back) and Herbert at punter. "It's going to be competitive," Filkins said. "It's going to take everything we've been doing, and then, like coach said, just take it up one more notch." "We just have to work our (tails) off this week. We have to grind, grind and grind," added Dukart. "There's no letting off the gas pedal."